I just wanted to comment that I’ve been feeling the same way. I’m still in college though, so maybe it’s weird to be worried so much. Anyway, like the comics! The spark of life that everyone has in the early days of life often fades in the majority of people. Yet, it never dies, it only needs air to breathe again. There’s no re-sparking, just fanning the embers. Most shy from it for comfort and security of normal and familiar. Every so often there are those that stand up and push forward. The great thing about that, is everyone can do it, you just have to wish it. Lotion. Putting lotion on your tattoos daily will fix that issue of fading. I understand the metaphor being made, but I find something visual always helps. When I feel down, drained, lacking all energy and completely… dead I switch things up! Make things different in your life! Even if it’s just trying something new. Like… polar bear wrestling! 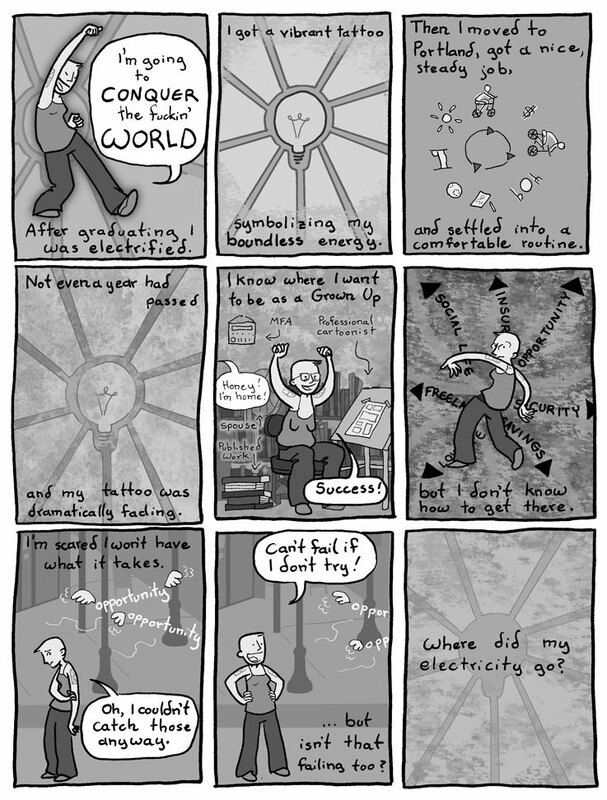 I love your comics so incredibly much, and as I was re-reading them (again), I came across this one. You know, since you did this comic, you’ve gotten your work published, gotten married, and are considered (in my eyes, at least) a professional cartoonist. That’s about all of the goals you listed in panel five! Just so you know, the fact that you were so unsure of yourself in this period and still achieved so much keeps me going every day. Thank you! I think most people would consider me successful at this point (or almost), but I STILL feel this way, and so most people in my program. It may never go away. However somehow, I’ve refound my ‘spark’ and start to want to get out of the house again, see things, meet people and be happy! I guess I realized I wouldn’t get anywhere with feeling sorry for myself. I still don’t like hearing that, but I guess it’s better hearing it from myself than anyone else… I think the way I realized it was by doing nothing at all, it made me realize how boring it is to do absolutely nothing and have no goal you want to achieve.. But there are other ways of realizing as well, it could be a persuasive friend or a story you read, maybe it’s the realization your isn’t as bad as you thought because of shock or horror.. You’re not helpless, there are still good things in the world, however few they are, they do excist!!! and most of all you are not alone, there are enough people who understand you, around you or on the internet.. they are real!! I still haven’t figured out exactly what I want to do, but I do know that I never want to stop singing and that I want to help other people.. And in order to be able to get out of bed to do that is being a little selfish and do things I want to do, for myself.. But that doesn’t make me a bad person.. I would say the person who tells you that or anything else that makes you feel a bad person is the person at fault.. They are doing something worse than you are.. So rest assured you are not the devil or some sort of twisted person. You are you. You have ups and downs and you are one of a kind and one in a million. You are different and all the same. You are a great person!!! So if it’s a job, a lover, a friend, a place, your studies, a condition, or anything else, you can make the switch, there is always something you can do to change the situation to your benefit.. You can take a break, stop completely, talk things out, try and look at things from a different perspective or make a small change.. However, you do need to think things through a little to make sure you won’t feel regret about it.. But if you know yourself well enough, you know that you CAN make the best out of this situation, and the next, and the next, and the next! !